This tree grows along 21st Ave.S. It is on the left as you take the sidewalk from the corner of the greenspace in front of Cohen Hall towards 21st. 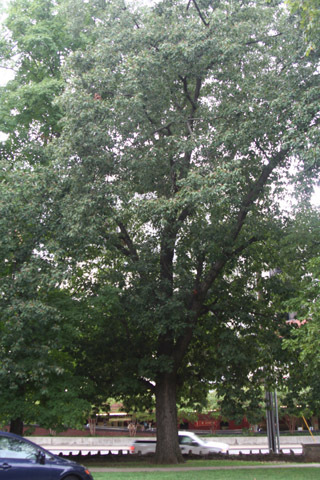 Northern red oak is a representative of a large group of similar oaks present in this area. Members of the red oak group ( Quercus rubra , Quercus falcata , Quercus palustris , Quercus velutina , Quercus shumardii , and Quercus coccinea ) have leaves with pointed lobes that are bristle-tipped. The members of the group can only be distinguished by careful examination of their leaves, buds, and acorns. Northern red oak leaves have lobes that are fairly wide and the leaf sinuses do not extend deeper than half way to the mid-vein. Buds are not particularly hairy and the acorns have caps that do not extend very far down the nut. Perhaps the most noticeable thing about large red oaks is that their bark typically has a "striped" look caused by the flat tops of some of its ridges. To distinguish among oaks systematically, see the key of oaks. This organism is a living specimen that is part of the  Vanderbilt University Arboretum  with the local identifier 1-508.